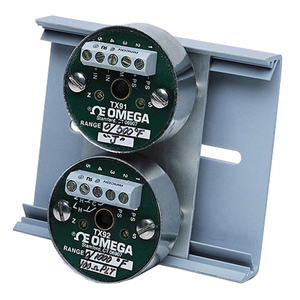 The economical OMEGA™ TX91 and TX92 two-wire transmitters provide an output current of 4-20 mA proportional to the mV signal of a thermocouple or to a two- or three-wire RTD sensor input. The TX91 or TX92 is very compact and can mount directly within OMEGA’s NB1 cast iron protection head. By having the transmitter near the sensor, the effects of electrical noise can be minimized and long runs of thermocouple wire can be eliminated.